Growing up, when my grandparents hosted family dinners on holidays there was always a "kid's table". Set up beside the "adult table" was a small card table for just my cousins, brother and I. If your family has a table for the little ones, try dressing it up with a fun centerpiece and place cards. This centerpiece can be created by the kids as the parents prepare the Thanksgiving feast. 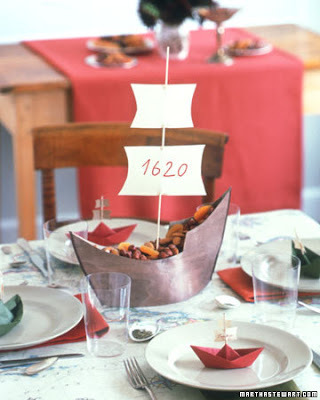 This Mayflower centerpiece can be created by kids with the help of an adult. Fill the centerpiece with candies, nuts or dried fruit. 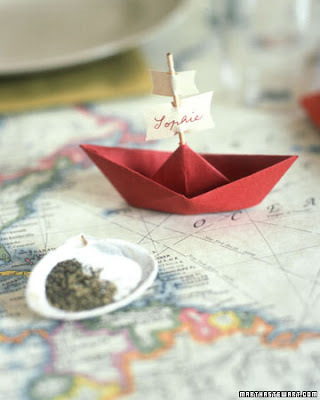 Fold paper into tiny boats, adding a sail made from a toothpick and slips of paper. Each child's name is then written on the sail and used as a place card.